A few months ago, I needed some small speakers: something with a 5" woofer at most, and a cabinet that would easily fit on a bookshelf. The received wisdom in speaker design says that small speakers can have deep bass or high sensitivity, but not both. I wanted something that went below 60Hz, which meant that its sensitivity would be low. Searching for that combination led me to Pioneers S-HF21-LR, which has a claimed frequency response of 55Hz-20kHz, a rated sensitivity of 80dB, a 5.5" injection-molded plastic woofer, and a 0.75" tweeter. It stands 10.25"W x 6"H x 6.25"D, weighs about seven pounds -- and retails for $49.98/pair USD. The S-HF21-LRs primary US retailer is electronics chain Circuit City, and during the week of my search CC was selling them for $30/pair -- a deal that shows up regularly. For that price, I figured it was worth picking up a pair to try out. After listening to them the first night, the next day I rushed out to buy a second pair before CC changed their minds and started charging a fair price. Pioneer's manual clearly states that the S-HF21-LRs should be pointed directly at the listener, but sometimes that can cause speakers to sound a bit more forward in the treble than they should. Since I noticed a bit of upper-midrange emphasis during my listening, I briefly hoped I might soften the S-HF21-LRs' sound a bit by adjusting the speakers' toe-in angle outward. Bad plan -- those guys at Pioneer know their speaker. The S-HF21-LRs lost a lot when I turned them away, and by the time I had them facing directly forward, the center image had collapsed entirely. In short: The S-HF21-LRs direct sound was good, its off-axis sound rather bad. I definitely wouldnt want to use them for the front channels in a home-theater setup with multiple seats, but Ive been happy with them serving as the rear speakers in my not-so-ambitious theater. I experimented with removing the speakers grilles. They were a little tight, but I slipped something thin between them and pried them out. The sound was always much better with the grilles off, and I kept them off for the entire review. Another problem was the S-HF21-LRs cheap, spring-loaded input terminals -- youll be hard-pressed to use any speaker cable terminated in anything other than bare wire. It became obvious from the disassembly I did that upgrading the Pioneers to real binding posts would be hard to do without breaking the rear panel. The main thing that impressed me about the S-HF21-LR was how clean its midrange sounded. Vocals came through with a simple clarity that embarrassed some more expensive designs. One of the first recordings I played was Chris Reas wonderful On the Beach [CD, East-West 2292-42375-2], and his voice just jumped out at me with a richness I normally expect only from "serious" speakers. The land of the tiny budget speaker is filled with speakers that disappoint in this area; the S-HF21-LR didnt. Female vocals didnt fare quite as well. Listening to Beverly Cravens Love Scenes [CD, Epic BK 57742], I was disappointed to hear that the plentiful sibilants that fill the title track, particularly the word scenes, were much too harsh compared to the more neutral sound Im used to hearing. I played some other favorite female vocal recordings, but before I even got to Annie Haslams singing on track 2 of Renaissances Scheherazade [CD, BTM ARC 7017], I realized that the piano sounded far from natural. Haslam sounded fine, but the mass of instruments that accompany the chorus of "Vultures Fly High" overwhelmed the speaker, and everything sounded a little dirtier than Id like. Complicated passages with extreme dynamics are the weakest part of this Pioneer design -- unsurprising, given its low sensitivity. During passages with considerable bass content, the bass disturbed the higher frequencies more than would be acceptable in a more expensive design. Nonetheless, as youd also expect from its claimed frequency response of 55Hz-20kHz, the S-HF21-LRs bass response sounded as if it had enough honest low-frequency extension for most music -- and went plenty low enough to make integrating it with a subwoofer easy. But the real question at this point was how much power this low-sensitivity speaker needed to accomplish that. For this test, my first tool was an old Proton D1200 amplifier, whose wattage meters Ive relied on in the past. The second tool was the classic analog Sound Level Meter from RadioShack. I popped in light earplugs and sat about 6 from the speakers, the meter in one hand, remote control in the other, and started to crank er up. Playing demanding music, I was lucky to dump 25W of power into the Pioneers before their woofers began to make frightening noises. Searching for songs compressed enough that I might coax a bit more power into the speakers, I ended up with Journeys Greatest Hits [SACD, Columbia CS 44493], which includes some near-perfect examples of car-radio-friendly production; in short, nothing thats too difficult to reproduce. "Be Good to Yourself" was an ideal test case: it has hardly any information in the deeper bass range that might bottom out a small woofer. Playing this track, I got the average volume level up to 90dB (about 15W on the Protons meters), and regular peaks of 95dB (30W). I was never able to find a real musical load that used any more power than that. With most music, the S-HF21-LRs ran out of useful musical power handling long before they used even 30W. The 90-95dB at my listening position was consistently as loud as the Pioneers got before I began fearing Id damage them. As far as playing cleanly went, I found that when I sat 6 away from them, the S-HF21-LRs upper limit of sounding good was 80-85dB. Most of the time, when I found myself unhappy with the sound, I would check the RadioShack meter and discover that the speakers were playing just above that range. Some really demanding material sounded a bit congested at any volume -- though again, this was the S-HF21-LRs main weak point. But clearly, you wont need much more than 30Wpc to run these speakers. Thats not to say you can use any old 30Wpc amplifier and get good results. During my testing with the Proton D1200, I found myself losing the initial happy feeling Id had about the S-HF21-LRs. I feared that the afterglow was over and that Id started to dwell on the speakers limitations. I reinstated my usual reference amp, the Warner Imaging Endangered Species ($2195 when available), and found that Id been dead wrong. All that had happened was that Id been hearing, as clear as day, the weak points of the Proton. The imperfections that had long ago caused me to stop using that amp for serious listening were made perfectly clear through the inexpensive Pioneers. Well spotted. But the right inexpensive receiver, and a source such as the Sony DVP NC-650V SACD player ($250, discontinued), may be a perfectly sensible choice. I pulled out a decade-old Yamaha RX-485, rated at 65Wpc, and it was the best match yet. Some of the rough edges that had bothered me before, such as the sibilants on Beverly Cravens "Love Scenes" and the piano distortions on the Renaissance album, were considerably smoothed out. It was a better partner for the Pioneers than the Proton in terms of tonal balance, but the congestion during complicated passages was a bit worse than with my reference amp. Still, the S-HF21-LRs now had no problems reaching 90-95dB at my listening position, meaning that this receiver played just as loud as the 200Wpc Warner Imaging Id been using before. I also listened to the Polices "Synchronicity II," from Synchronicity [SACD, A&M 069 493 606-2]. This is another challenging mix, and when I turned up the volume, I was, as usual with the Pioneer S-HF21-LRs, disappointed by how choppy the vocals became during the complicated parts. Switching to the less busy "Murder by Numbers," I found myself having a bit of a revelation. Playing that song through these speakers, from a good SACD source and with a good power amp, sounded better than the CD version does even through my best speakers. Some people advocate investing the majority of your audio budget in your speakers, with only a small portion reserved for your source and electronics. 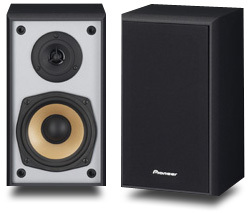 For musical styles that dont include heavy dynamics, these inexpensive Pioneer speakers strongly argue the opposite. Id take the combination of the Pioneers and a good electronics chain over a great speaker and awful electronics any day. The sound quality of Pioneers S-HF21-LR is a testament to the efficiency of modern manufacturing. That such a design can be built in China, shipped around the world, then shipped to my local store, and bought at retail for as little as $30/pair, is amazing. The speaker has plenty of faults. Its low sensitivity and low maximum output level will be a deal-breaker for some. Its dynamic compression, and the fact that it sounds right only when listened to on axis, will make it unsuitable for some needs. But the S-HF21-LR is free of the ugly sound of many very-low-budget speakers, and its relatively pure midrange performance makes it very useful for many people and applications. The S-HF21-LR is a particularly interesting option for people trying to build a low-budget system one component at a time. I could see someone whos just getting started buying the CD or DVD player and amplifier they really want right now, and scrimping (for now) on their speaker investment by getting a pair of S-HF21-LRs. I highly recommend that speaker buyers who need to watch their pennies check them out.